CM Fadanavis felicitates Jain Irrigation with "Uttar Maharashtra Ratna"
Jalgaon, December 22 (Reporter):- "Jain Irrigation founder chairman Bhavarlalji Jain was instrumental in extending the high technology in water management to not only Khandesh but even beyond the boundaries of India to more than 100 nations abroad. He had a lion's share in water saved due to the high technology of drip and sprinkler irrigation," said Maharashtra CM Devendra Fadnavis here while praising the contribution of Bhavarlalji Jain and Jain Irrigation. He honoured Jain Irrigation Chairman Ashok Jain by conferring the "Uttar Maharashtra Ratna." 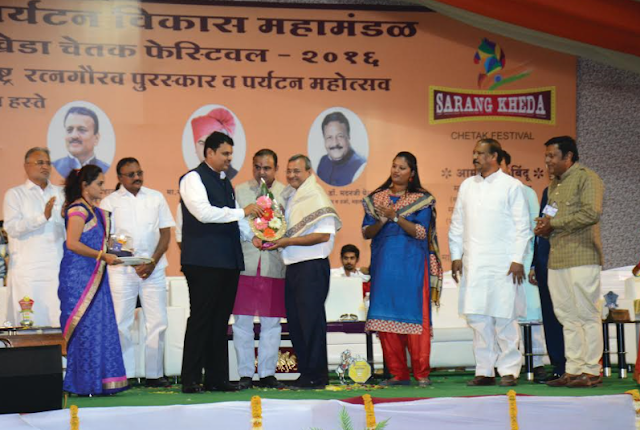 His brother and Maharashtra Marketing Chief of Jain Irrigation Abhay Jain accepted the Award in a grand ceremony held at Chetak Festival held at Sarangkheda in Nandurbar district with a history of over 300 years. Photo Caption:- CM Devendra Fadnavis giving "Uttar Maharashtra Ratna" Award for Jain Irrigation Chairman Ashok Jain to Maharashtra Marketing chief Abhay Jain. Toursim & Employment Guarantee Scheme Minister Jaykumar Raval, Dr Vijaykumar Gavit and MP Dr. Hina Gavit are also seen. Several dignitaries in North Maharashtra (Uttar Maharashtra) who have worked tirelessly in different spheres of life have won this award. Along with the Chairman of Jain Irrigation, Ashok Jain, Builder from Dhule Subhash Runwal who settled in Mumbai, Raval Group of Industry's Jitendrasingh Raval who hails from Dondaicha, Khabiya Group's Kishor Khabiya settled in Mumbai but hailing from Bhadgaon and Dr. Bhabha Atomic Research Centre's Dr. Tushar Devsar were also given "Uttar Maharashtra Ratna" Award. The felicitation ceremony at Chetak Festival was held to create a role model before the youth in Khandesh to motivate them to work diligently for a noble cause. There is a temple of 'Ekmukhi Dutt' of Mahanubhav sect at Sarangkheda. Lakhs of people from Mahanubhav sect from Maharashtra, Gujarat and Madhya Pradesh (M.P.) converge on this place. This festival began on December 3 and will be on till December 27.